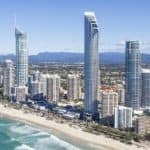 Many claim Adelaide Australia Beaches are the best in Australia. For many, much of Adelaide’s appeal is due to its coastal setting, alongside Gulf St. Vincent. Many tempting beaches are close to the city, being dotted along its western and south-western shoreline. 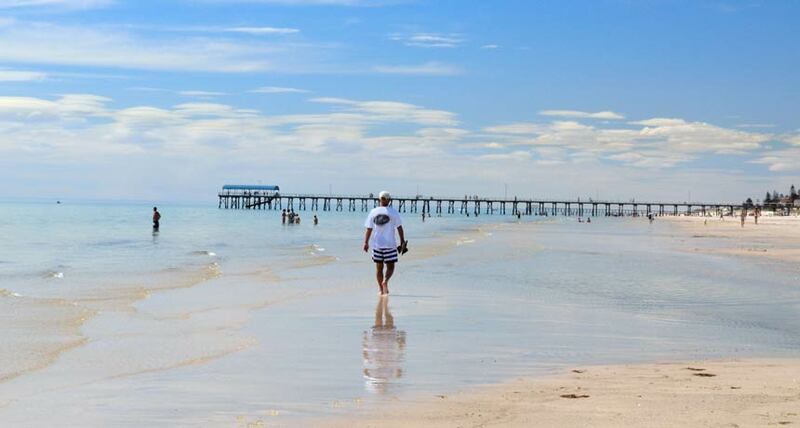 Henley Beach is among the closest to central Adelaide and resides off the lengthy Esplanade, where swimming, jet skiing, kayaking and sunbathing are all popular activities. 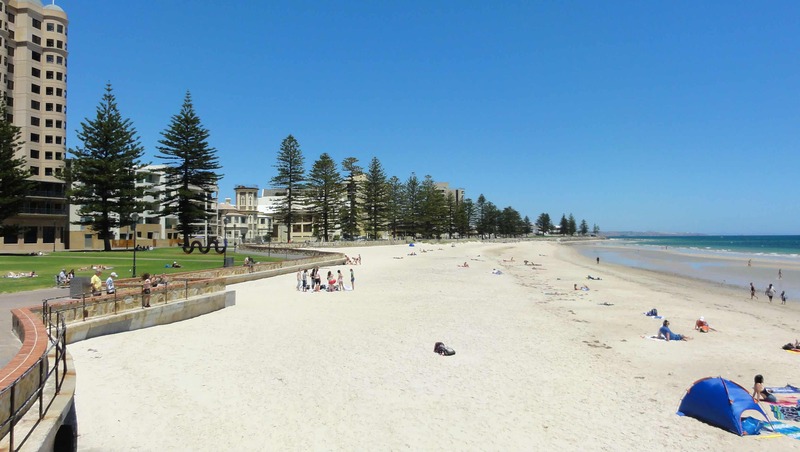 Glenelg is another hugely popular area for regional beaches, along with Largs Bay, Semaphore Park, Somerton Park, Port Noarlunga, Christies, Moana, Maslin and Aldinga, running north to south. Barbecue facilities, picnic tables and nearby restaurants are just some of the amenities that you can expect on the most popular stretches, along with volunteer lifeguards during the busiest weekends. Vacationing to Adelaide? Head to our Adelaide Travel Guide. 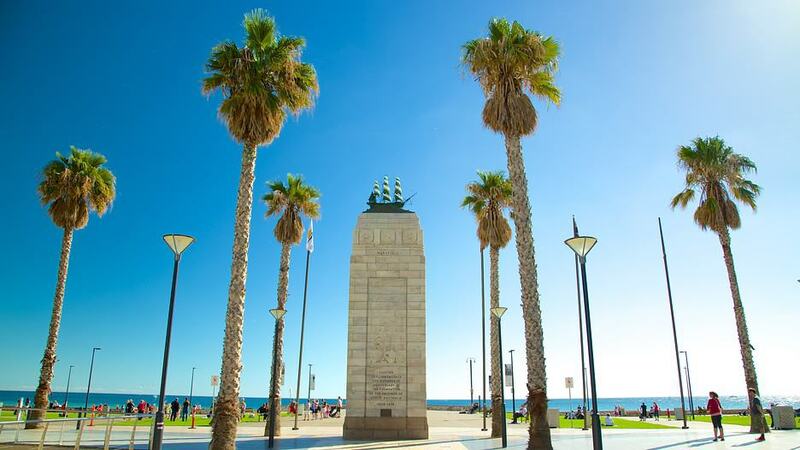 Located only 10km from the center of Adelaide, Glenelg is a popular vibrant seaside suburb. The main street of Jetty road features many specialty shops and a tram service to and from the city. 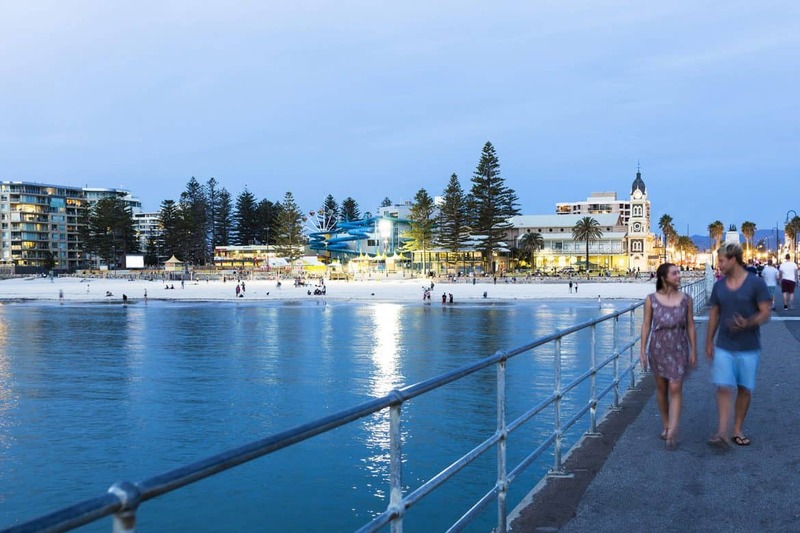 Glenelg is the site of South Australia’s original mainland settlement in 1836, it features a visitor information center, sandy white beaches, 7 day shopping with over 200 specialty shops, museums and galleries, restaurants and cafes and plenty of holiday accommodation. It’s also home to the Beachouse, a fantastic amusement complex with water slides, dodgem cars and more. Enjoy a drink and soak up the view at the Stamford Grand Hotel on the esplanade, or enjoy a meal whilst watching the boats cruise in to the marina at Holdfast Shores. The beach is white sand and like most Adelaide beaches, shoals gently away with no sudden drop-off in water depth and is family friendly. You can walk the 3.5-kilometer Federation Trail from Glenelg to Seacliff and Kingston Park which takes in some of the historic elements of the district, with its one-time workers’ cottages and some outstanding examples of colonial architecture. If you keep walking to Marino Rocks you will pick up the Marino Rocks Boardwalk Trail. This an excellent trail stretching for 7.5 kilometers to Hallet Cove, rising and falling as it hugs what is in part a rugged coastline. 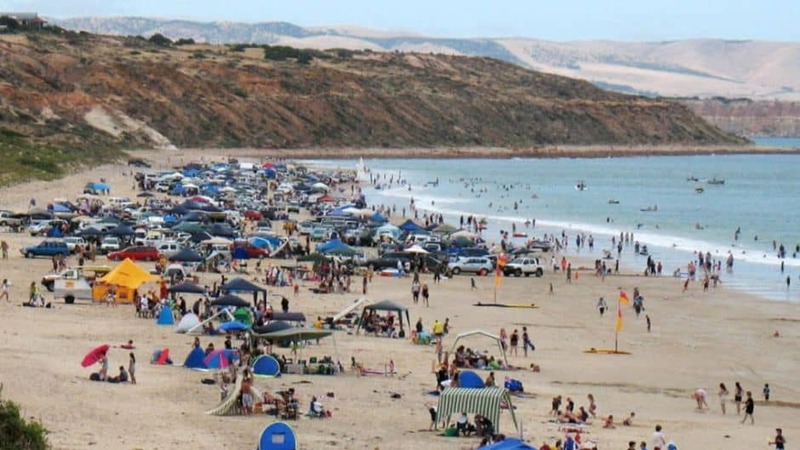 Hallett Cove Conservation Park has a beach which is suitable for swimming and fishing. Henley Beach is one of the two closest beaches to Adelaide central business district and is a favorite spot to cool off after work on hot summer evenings. Henley’s bustling center of beach side activity revolves around the grassy foreshore, jetty and alfresco cafe precinct. There are nine restaurants within the precinct offering a variety of cuisine including Thai, Greek, Italian and good old Aussie fish and chips. Henley Beach has got to be one of the best value for money beach-side metropolitan suburbs in Australia. Approximately 10kms to the city of Adelaide & 10 minutes to the airport, (without being under the flight path) Henley Beach really can enjoy the ‘ten minute city’ rule. Aside from being close to some great amenities, you can’t discuss Henley Beach without mentioning the superb beaches & crystal clear waters. Great for families, there is hardly ever surf at Henley Beach & the surf life saving club does a tremendous job patrolling the beaches during peak times. The beach is kept clean & locals are very good at doing the right thing with their dog mess. 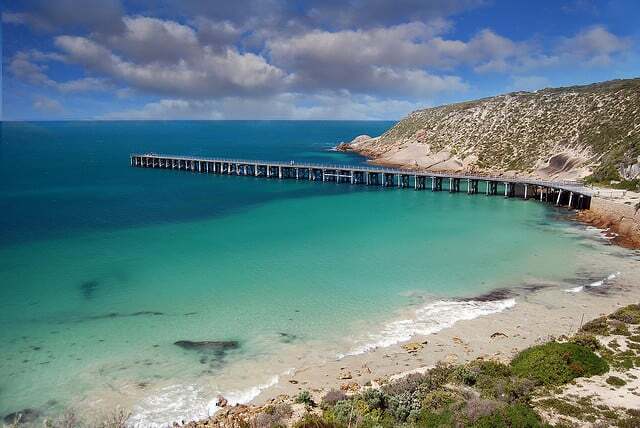 Horseshoe Bay located at Port Elliot on the Fleurieu Peninsula is a picturesque and sheltered swimming bay, offering swimming & body surfing for all ages. A favorite spot for families, particular during the Xmas holiday period. Enjoy what is arguably South Australia’s best fish and chips at the conveniently located Flying Fish Cafe, overlooking the bay. Horseshoe Bay is one of the safest and most picturesque swimming bays in Australia offering swimming and body surfing for all ages and is patrolled seasonally. An extremely popular holiday spot for locals from Adelaide to spend their holidays, Middleton has an abundance of holiday homes for rent and enjoys a relaxed laid back vibe. 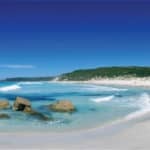 Middleton Beach is one of Albany’s most stunning seascapes, and is popular for its safe swimming, windsurfing and picnicking. Five kilometers of pristine white sand means there’s plenty of space to find your own stretch of beach. Across the horizon are two picture-perfect granite islands, Michaelmas and Breaksea. Fishing is popular from the jetty and it’s also a great place to watch the sunset into the ocean. Middleton Beach has picnic and barbecue facilities, as well as playground equipment. Boomer by name, booming by nature, such is the way of the angry ocean surf off Encounter Bay. Not for the faint hearted, the ocean swell comes barrelling in from Antarctica and lashes Port Elliot’s renowned surf beach. With strong tidal currents and huge waves, Boomer Beach has excellent surfing conditions, which are often suitable for only the most experienced of surfers. Boomer is also well-known for its seasonal whale watching, when each winter humpback whales can be viewed from the shoreline, as they migrate to warmer waters and head to their northern breeding grounds. 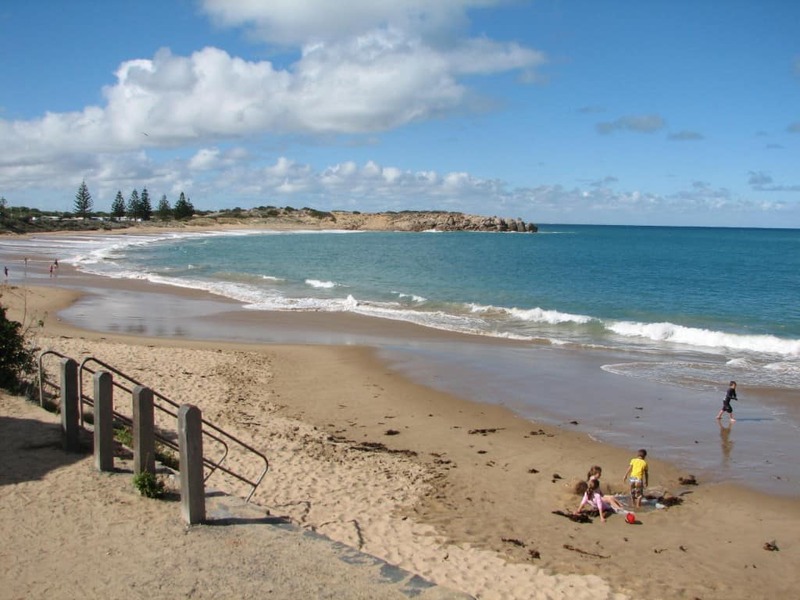 Boomer Beach is situated in Port Elliot, a small town within driving distance of the city center. Once proclaimed the ‘best beach’ in Australia, Vivonne Bay is a long, curved, sandy beach superb for picnics, beach combing, surfing and fishing. Experienced surfers enjoy the wonderful turquoise waters; fishing from the jetty, beach, boat or the Harriet River mouth is excellent. The beach can be reached by taking the road just past the Vivonne Bay store. Safe swimming areas can be found near the jetty or the sandy-bottomed Harriet River that enters the bay nearby. On the other side of the river, Point Ellen provides photographers with spectacular views of the Southern Ocean sending its waves crashing onto the cliff-face. Vivonne Bay is the only safe harbor on the south coast of the Island and is the base for cray-fishing boats from November to May. Barbecue, picnic areas, toilets and camping facilities are available. Known locally as Millionaires’ Row for its fabulous real estate, Island Beach is the quintessential beach holiday location. Fringed by dense bush land, the sandy beach stretches almost as far as the eye can see and provides very safe swimming. A walk along the coast towards American River has plenty of bird watching opportunities. Boats can be launched from the beach. Long Beach is approximately 12 km long. Four wheel drive vehicles can generally drive on Long Beach without worrying at any time of year. If you have a two wheel drive, from roughly October to April the tide goes out and the sand is hard allowing you to drive on this beautiful beach. Sultana Point, just south of Edithburgh is a quiet beach with a number of shacks and dwellings lining the foreshore. There is limited access here due to property owners, with the best access at the southern end of the beach. The long white beach here is fantastic for swimming, and you can even watch the majestic wind towers at Wattle Point Wind Farm and you relax in the crystal blue waters. The Edithburgh Tidal Pool is an enclosed pool area, which is extremely popular for swimming. Also nearby is a small beach area perfect for swimming. Further along the Edithburgh foreshore, you will find the beach immediately in front of the Edithburgh Caravan Park; this beach is popular for small children to swim. Swimming and diving is popular from the town jetty. The beach at nearby Wattle Point is good for activities, such as swimming or fishing. Black Point’s long stretch of sand edging a glistening bay makes it a popular destination for holiday makers. One of the few remaining holiday spots where you can stay in accommodation right on the beach and soak up the views. Relax while fishing, swimming, sailing, boating or crabbing. 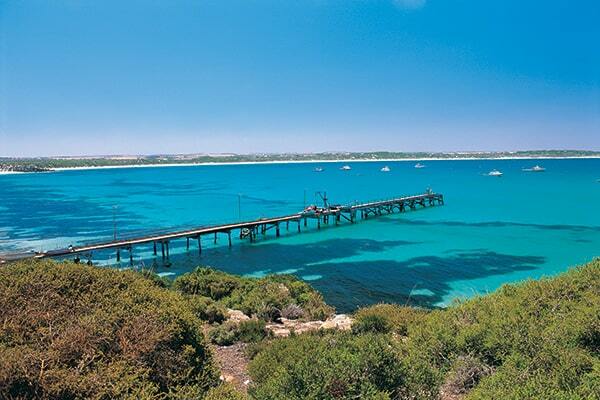 Black Point is centrally located on eastern Yorke Peninsula, which is home to fantastic beach-side towns, premier surfing destinations, heritage sites, great restaurants and more. Brighton Beach resides on the south-western side of the city, next to the Bindarra Reserve, where it is best reached by taking the Anzac Highway / A5. This is a relaxed and informal sandy stretch, ideal for sunbathing, swimming, snorkeling and off-shore fishing. Nearby are a number of shops and small restaurants, often specializing in seafood. Sited on the famous Adelaide coast, Moana Beach is easy to reach and is conveniently close to the Noarlunga train station, with regular trains to and from the central train station. Highlights include sandy expanses ideal for sunbathing,calm waters suitable for swimming, snorkeling and scuba diving, seaside walks and nearby cafés. 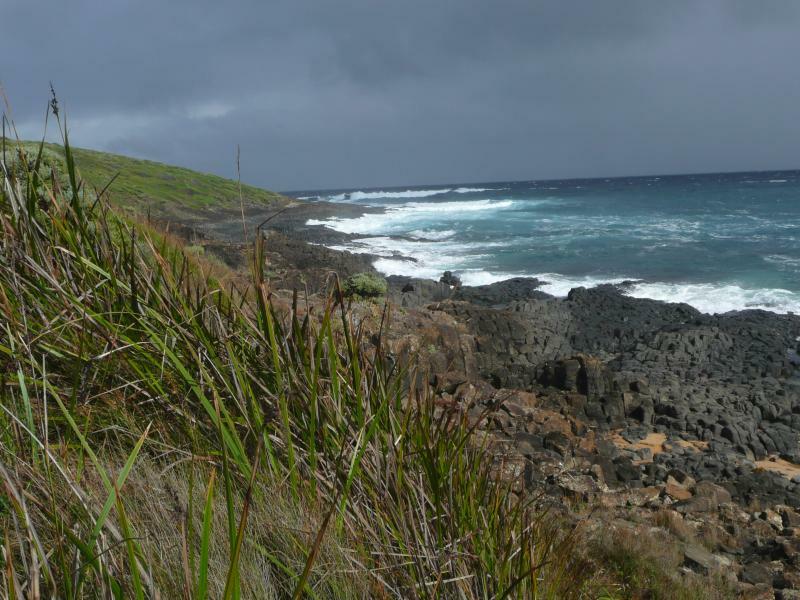 You may also like to check out the attractions within the adjacent Moana Sands Conservation Park and the Graham Rabbett Reserve. Located on the south-western side of the city and within the Kingston Park suburb, Seacliff Beach is always popular with both locals and tourists. Attractions include sunbathing and boating, while there are also convenient gas barbecue facilities. Of interest, both the Marino Conservation Park and the O’Halloran Hill Recreational Park are relatively close by. 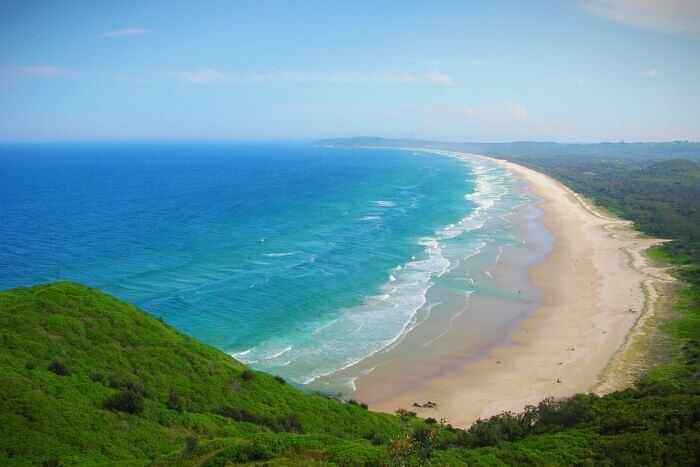 Waitpinga Beach is situated on the outskirts and is easily reached by car. 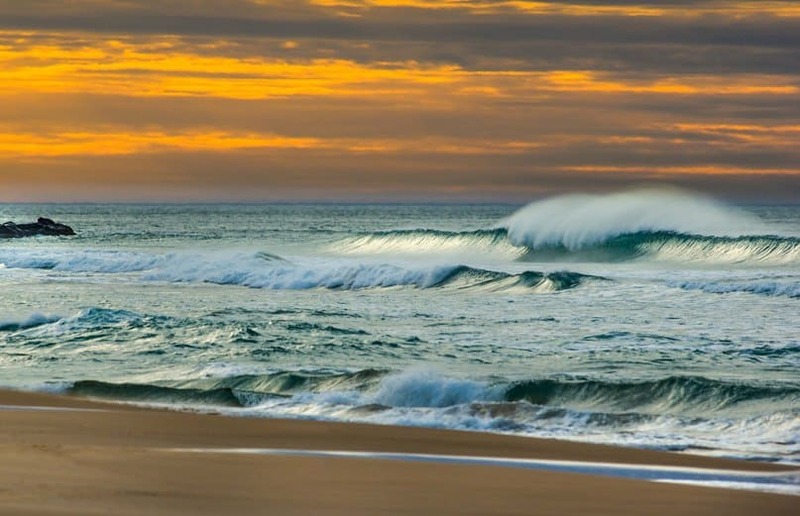 This popular location features strong waves and breaks, and so is favoured by experienced surfers. 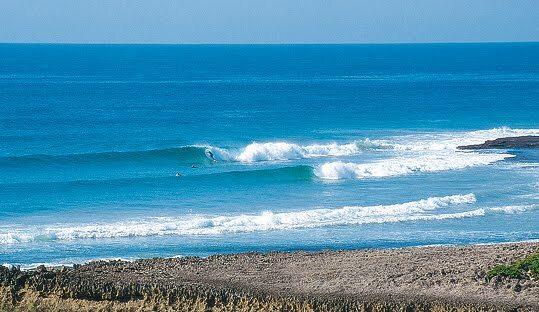 Waitpinga attracts many locals from all over South Australia, including both surfers and spectators. 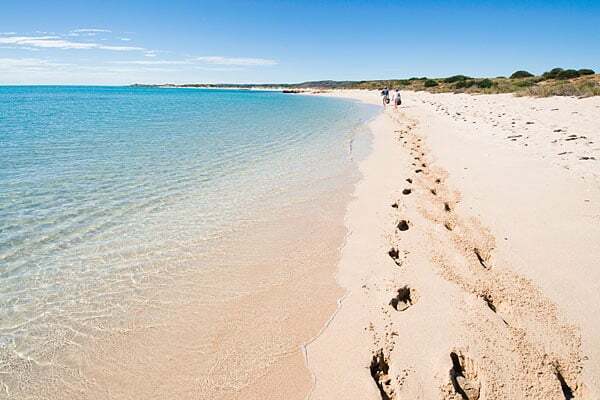 West Beach is to be found just 5 km / 3 miles from Adelaide Airport and around 10 km / 6 miles from the city centre. Surrounded by vast parklands, this spot features sailing, swimming, surfing, fishing, a nearby golf course and boating sheds. 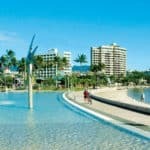 Visiting Adelaide on a cruise in Feb 2019 and wanting to do a beach day. How close are the beaches to the cruise port or what is best and easiest way to do one. Yes, I would recommend I recommend Henley Beach, as well as Semaphore beach. You can take a taxi to both of these. Semaphore Beach is about a 10 – 15 minute taxi ride and Henley Beach is about a 25 minute drive. There are plenty of great restaurants in Henley Square while you are there and you’ll find lots of shops as well as places to eat. Please let me know if you have any additional questions. Beautiful beaches! 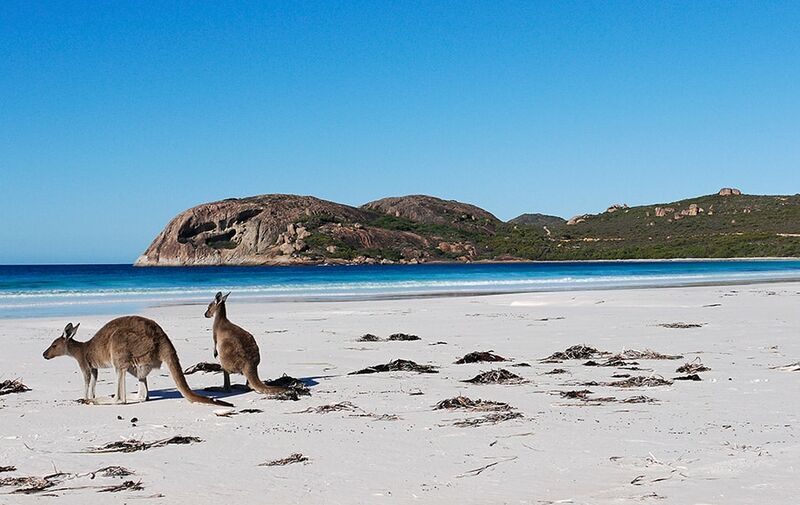 Who wouldn’t love chilling on a beach with a kangaroo! That would be a great experience. Exactly! I love kangaroos anyway. To have wildlife roaming around on the beach with me, fantastic! Thanks for visiting Adelaide Australia Beaches! Those places look amazing! I have not visited any of them yet, but you have given me ideas for future travel destinations! Thanks! They are amazing 🙂 I hope you can visit Adelaide Australia beaches soon! Thanks for reading. 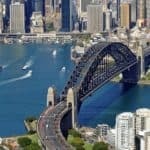 I am looking to make a trip to Australia next year and am looking for advice as to the best way to make use of our 3 week trip. You make Adelaide sound very appealing, even if I am no surfer. It has made me realise that Adelaide has so much to offer so probably will be on my list of places to stay during our vacation. Thanks again for the review. You made my itinerary a little easier to organise. Good Karen! If you need any additional suggestions or help in your planning, please don’t hesitate to ask. I would love to help! Thanks for visiting Adelaide Australia Beaches. Wow they look amazing. 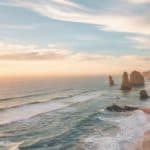 Adelaide is a place I have never been to personally, but friends tell me you are spoilt for choice with so many beaches there, especially surfing on the boomer beach. Thanks for sharing the information. Glad you enjoyed reading about Adelaide Australia Beaches Mark. There is really so much more to do at a beach destination besides laying on the beach. 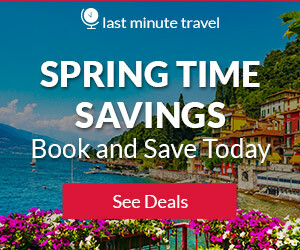 Please come back and visit BeachTravelDestinations.com again. These beaches looks amazing! I would love to travel to Adleaide. I particularly like the look and the sound of Island Beach and Brighton Beach. I just love the multi coloured beach huts there. Thank you thank you thank you for this. I have never been on a vacation since I have been an adult. My parents used to take us a lot when I was growing up. But I was thinking about going to a beach I thank you for so much for this list of options. It saves me a lot of time and going online and having to search for the best of the best. I really appreciate this review. I look forward to reading more from you in the future. Thanks for this again. You are very welcome Michelle 🙂 I am glad I could help. When you are ready to plan, let me know if I can help you in any way. Wow I’m amazed at the beaches on this post and how informative your descriptions are of each one. Me and my wife are planning our annervisery vacation and after doing some digging here and there we finally ended up landing on your site. I’m glad we did and I will be visiting Long Beach on our anniversary thanks to you. You are welcome and I hope you both enjoy and have a great anniversary! The beaches in Australia are so beautiful! I love the color of the water at Vivonne Bay. It looks so inviting. I’d love to be there right now on a vacation. Something to add to the bucket list. I’m headed to the Florida Keys in a few months. I heard it’s beautiful there too. I may invest in one of those waterproof digital camera to take pictures of the fish. Your site is awesome! Thank you so much Gina! A work in progress and I love the beaches! You will have a ton of fun in the Keys. A waterproof camera is a must for me, as they also are better in the sand too. I have ruined more than one camera from just the sand until I switched to the rugged waterproof one. I love catching the tram to Glenelg when I visit from Queensland, it is always a highlight. I usually go in the summer time over christmas holidays so it is quite warm. What other times of the year would you recommend visiting to make the most of the beach weather? What beach would you recommend for fishing and at what time of the year for that? I would recommend St. Kilda beach for fishing. If you have a boat, St Kilda has great access to the northern beaches. Your best bet is targeting bream, yellowfin whiting, mullet, salmon trout and blue swimmer crabs. You can also try your luck off the rocks, but early morning is the best bet. For the best weather, head there between September and February, December thru February is of course going to be the best months for beach weather. I recently met with my former high school teacher, who is now retired and travels a lot with her husband. And she mentioned that last year she’s been to Australia and New Zealand – and I decided to learn more when I came across your website. I love water – and I definitely enjoyed reading your article about the beaches. And the images – SO BEAUTIFUL! It made me go and travel right now (ha-ha). 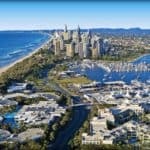 Is it true that the beaches in Australia more dangerous than in New Zealand (like more sharks and stuff)? Thanks for sharing your knowledge and looking forward to reading more! Thank you so much Zarina! The most prevalent shark attacks are in New South Whales, Queensland, the Northern Territory, and then New Zealand in that order. Australia and New Zealand are probably the deadliest place on Earth for shark attacks. They do, however, have safety precautions in place and beach goers should heed all of the signs. Of course! Have to have the cocktail to go with the beach spot! I have never even left the United States and honestly if I get a chance to, I will now be visiting Australia! Are there places near these beaches that you can go to to learn how to surf and sail? If not then they need to get on that haha! Oh, yes there are places you can learn 🙂 I have not done so myself, but my son keeps pestering me to.